Keeping your house and pets smelling good (or not smelling at all!) combines a balance of maintaining a house cleaning schedule, regularly grooming and bathing your pets, and making sure that your pets "behave" in your home. Yes, this first tip is stunning in its obviousness. 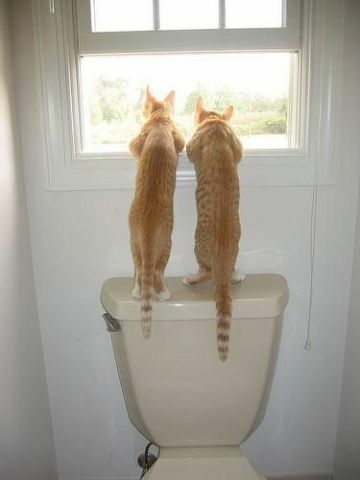 By opening the windows daily and keeping them open as much as possible, you will let fresh air into the house. This will help your home smell fresher. That, combined with a nice fan or two to help circulate air, will make pet smells less noticeable. First, DON'T USE SPRAY AIR FRESHENERS; they are harmful to you, your pets, and the environment. 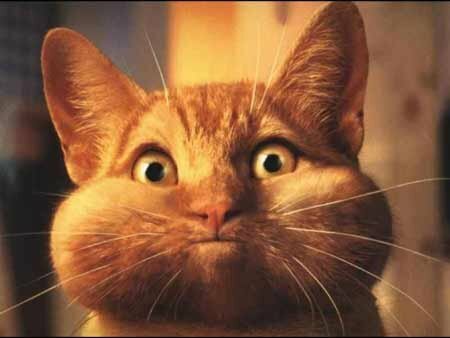 Second, if you have cats, make sure you use a separate litter box for each cat, use a natural, low-odor cat litter like Arm & Hammer Essentials Multi-Cat Natural Clumping Cat Litter, and clean the boxes at least once a day for your cats' health and yours. Wash the cat boxes out weekly with a non-toxic, deodorizing cleanser. Third, you can cover pet smells in your house with a fragrant candle. My single all-time favorite candle, the Pet Odor Exterminator Candle, is one that is actually made to disguise pet odors, but I use it to rid the house of pet, cooking, garbage, and bathroom odors. If you like having a more low key, consistent fragrance in the house and you already have a favorite scented candle, try this electric candle and tart warmer. Some pet owners swear by the deodorizing power of vinegar. Yup, leave a cup of white vinegar on a counter or table to help reduce stinky smells in your stinky room. If you don't like the smell of this vinegar, just add some citrus rinds to it to make it nicer smelling or use apple cider vinegar instead. For folks who want to avoid having to cover up odors, you can also try odor absorbers. Moso Natural has a popular air purifying product that users seem to love; it's especially good for the odors around cat litter boxes. Many air purifiers are a waste of money, but a really good air purifier can help significantly reduce pet odors in a home. Our favorite air purifier is the GermGuardian. You can read a product review about the GermGuardian here. Activated carbon filters remove odors, and the air filter reduces pet dander, making a noticeable improvement in the quality of the air you breathe. Place the air filter in the smelliest room and it should help improve the overall air quality in all the rooms in your house. Another very highly rated air purifier is The Germ and Mold Destroyer Air Purifier by Hammacher Schlemmer. This small gem has been tested independently and found to eliminate up to 99.9% of airborne bacteria, mold, viruses, pet dander, dust mite allergens, and pollen in a room up to 550 square feet. It's only 10.5 inches high and It doesn't make any noise! Also remember to change the HVAC filters in your house frequently. It will help your system run better and, with fresh filters, it will do a better job of cleaning the air in your home. Baking soda is not only the primary ingredient in most vacuum powders, but it naturally absorbs bad smells and pet odors. Since too many cleaning solutions and odor controllers can be toxic to your pets, plain baking soda is a safer alternative. Just sprinkle baking soda over carpets and rugs and over any smelly furniture. Let the baking soda sit overnight, and then vacuum it up the next morning. Just like that, everything will smell better. If you like, you can add some pretty smelling essential oils to the baking soda to act as an air freshener and not just an odor absorber. Just put a drop or two of essential oil into the baking soda and mix it with a fork. Then let the baking soda stand a few hours before sprinkling on the carpet. Just be careful using any essential oils - use only a tiny amount, as pets are more sensitive to odors, and some scents can even cause allergic reactions. Don't use tea tree oil around dogs or cats; don't use oregano, thyme and citrus oils around cats. It's tempting to let your pets on the furniture. 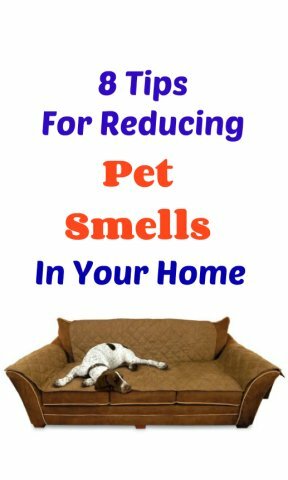 As nice as it is to sit next to your dog or cat on the couch, it generally causes pet odors to permeate the furniture. To prevent this from happening, you may want to train your dog to stay off the furniture. I am not one to keep my pets off the furniture. My dog stares down my guests who happen to sit down on his favorite spot on the couch, and my cat jumps on my laptop if I dare try to write a blog while sitting in "his" chair. You can throw towels or blankets on your furniture to protect it, but they can be easily moved around by your pet, so I do recommend using pet throws made for furniture. Surefit Pet Throws are a good option as they are form-fitting, sturdy, and can be laundered. Just be sure to wash them once a week to prevent pet odors from sticking around. Another thing you may want to consider is replacing your pet's bed if it is a source of strong odors. You should buy a washable bed or one with a washable cover. You can find good pet beds with covers and liners that are washable and designed to repel odors. There are some great recommended pet beds here with water-proof and drool-proof liners. Urine odors from your dogs and cats are likely to be one of the biggest potential sources of bad odors in your home. Buy a good enzymatic odor neutralizer to use for any pet stains. 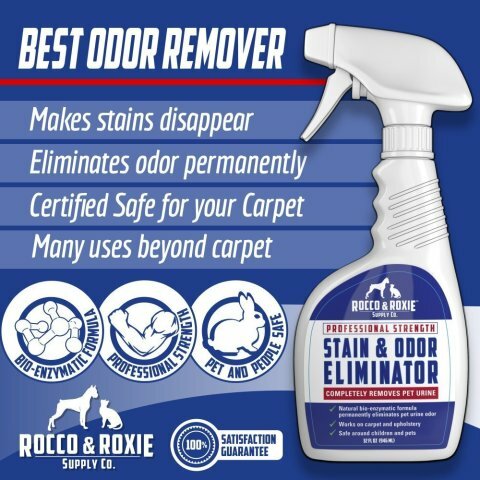 One pet stain remover we really like is Rocco and Roxie's Stain & Odor Eliminator. Clean pet urine and feces up as soon as possible and make sure to use an enzymatic cleanser. While your dogs and cats may look clean, a closer examination may reveal that they may need more frequent grooming or bathing. Many pet allergies and ailments express themselves through your pet's skin, sometimes emitting a foul odor. Based on their health condition and fur type, you should get bathing recommendations from your veterinarian. Your pet may need special medicated shampoo and cleansing wipes, but daily brushing is essential to remove loose fur and dander. Ask your veterinarian how often to bathe your pet, as bathing too frequently can remove natural skin oils, resulting in skin dryness or other unwanted conditions. Between washes, you can use the highly rated Earthbath All Natural Grooming Wipes, which remove dirt from your animal's fur and help freshen her scent. And pay attention to your pet's ear odors which, especially in some dog breeds, can be powerfully stinky from yeast or bacterial infections - find good ear cleaners here too. The most effective solution for pet odors is simple and obvious: keep your house clean...really clean. All the other tips here will help keep odors under control but you need to adhere to a regular cleaning routine to keep pet odors out of your home. If you can't vacuum all the carpets daily, how about vacuuming one key room a day? 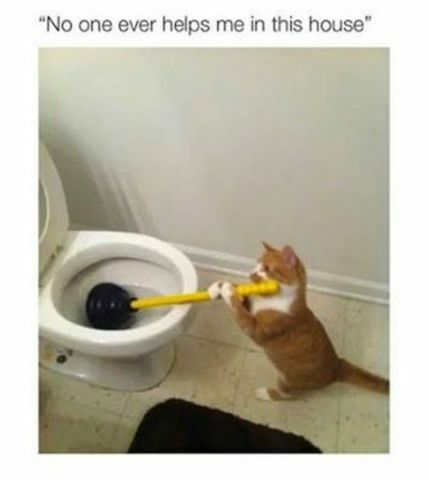 If you can't mop all the floors daily, how about mopping the most often used rooms a day or at least once a week? The important thing to do is focus more on the "hot zones," the areas of your home where your pets spend most of their time, and make sure to clean those parts of your home more frequently. I like to perform "must do" cleaning tasks daily, like the dishes, emptying the trash, and cleaning up a hot zone. Then I pick one extra item to do every day. I split my house into four general zones and focus on deeper cleaning in one of the four zones a week for the extra item. It keeps the house pretty clean overall and still makes the task of cleaning manageable. With these solutions, your house will start smelling better in no time! And if you have a solution to stinky pet problems, please share them with readers in the comment section below. Originally published August 2012 and last updated February 2017.